The most common species of pet hedgehog is the African pygmy hedgehog. An APH is a mix of the white-bellied/ four-toed hedgehog and the Algerian hedgehog. Other type of pet hedgehogs are Egyptian long-eared hedgehog and Indian long-eared hedgehog. Keeping hedgehogs as pets became popular in the early 1980s. Hedgehogs were originally classified as insectivores, but that order has since been abandoned and they are now in the order Erinaceidae. They are not rodents and there are several factors that separate them from other creatures like rats, chipmunks and porcupines. The main factor for classifying rodents is their jaw and teeth. Hedgehogs, unlike rodents, have canine teeth like a cat or human. Pet hedgehogs still have a natural fear of predators (including humans) so they often ‘ball up’. 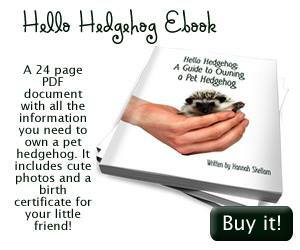 Handing a pygmy hedgehog a lot will help it learn to trust you and stop ‘balling up’. Hedgehogs come in over 100 colours. Since domestication began, lots new colours of have been created this includes albino hedgehogs. Pet hedgehogs prefer a warm climate (above 22 °C, 72 °F). Pygmy hedgehogs do not naturally hibernate but if they get too cold they can try. This is very dangerous for them as it can kill them. Hedgehogs in the wild eat a diet of mainly insects. The Romans used to keep a relative of the Algerian hedgehog as pets in the 4th century BC! They used them for meat and quills. The quills they used were to help train of other animals eg. to keeping a calf from suckling after it had been weaned. Even after the Romans stopped raising hedgehogs, their quills were used for card paper. Pet hedgehogs are kept in enclosures so sometimes they are allowed in residences where dogs and cats are not allowed. In the some parts of the USA & Canada it is illegal to own a pet hedgehog OR a license is needed to legally breed pygmy hedgehogs. This is because some hedgehog species can carry foot and mouth disease. These restrictions don’t exist in most European countries. Hedgehogs are nocturanl, meaning they only come out at night. In the wild, hedgehogs will cover many miles every night. Pet hedgehog need as much room as possible so they can get their exercise. Enclosures should be about 5 square feet. If hedgehogs don’t get enough exercise, obesity can be a big propbelm. You can see if a hedgehog is obease as it will have a double chin and fat drooping over it’s knees. Due to their small size obesity is a very dangerous problem and hedgehogs require a fair amount of exercise. Cages with wired floors are very dangerous for hedgehogs because they can get their little legs caught in the wire. 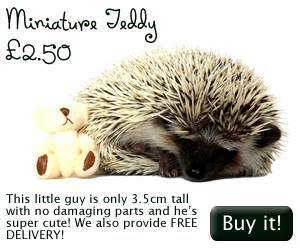 Hedgehogs have poor eyesight and cannot judge/understand heights so can easily fall of ledges! Don’t leave them alone on a table or have levels in their enclosure. Hedgehogs should not be fed nuts due to their mouth shape. Hedgehogs produce very little dander so unlikely to cause allergies. Most hedgehogs allergic to wood oils. The oil from in cedar can cause severe upper respiratory problems so don’t use cedar wood shavings. However aspen is a safe substitute. Hedgehogs are prone to cancer and it can spread quickly. Hedgehogs can also suffer from wobbly hedgehog syndrome. This is like MS in humans. Hedgehogs can get stressed out by lots of things including noise, new smells and new people. This can cause digestive problems like vomiting and green faeces. Erizos de tierra is Spanish for Hedgehogs!